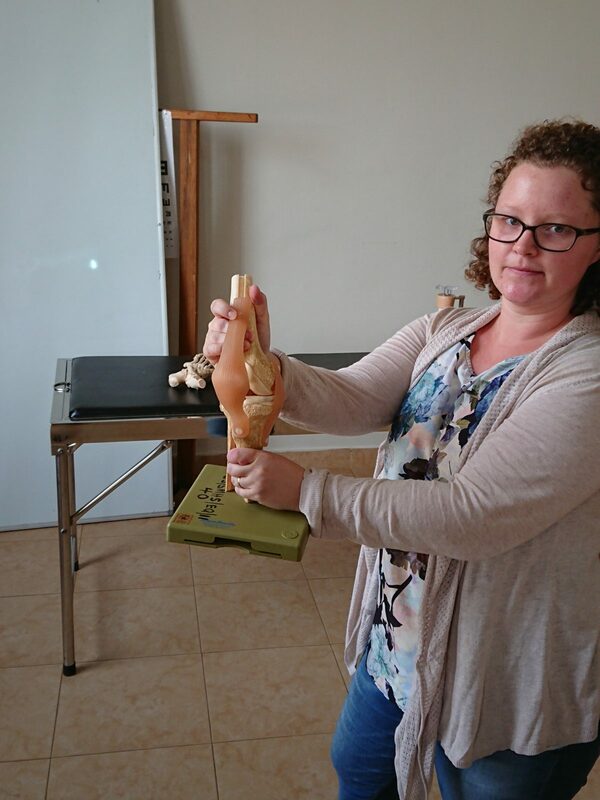 As the students worked their way from the neck and shoulder down to the knee and ankle learning to examine the musculoskeletal system, instructors pulled out anatomical models as teachers’ aids, but the instructors relied on the models for much more than anatomical recall. 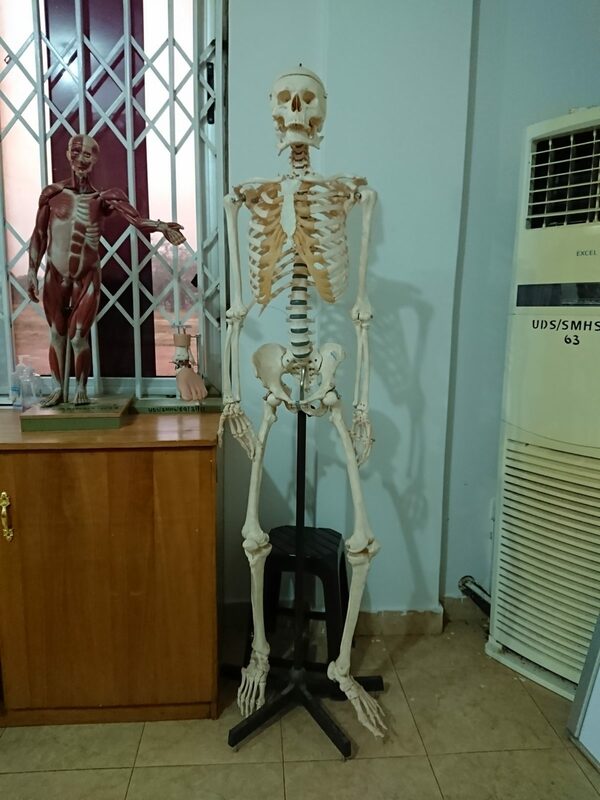 They used them to help students better understand how to conduct a physical examination, that is how to “look, feel and move” so as to elicit musculoskeletal maladies. 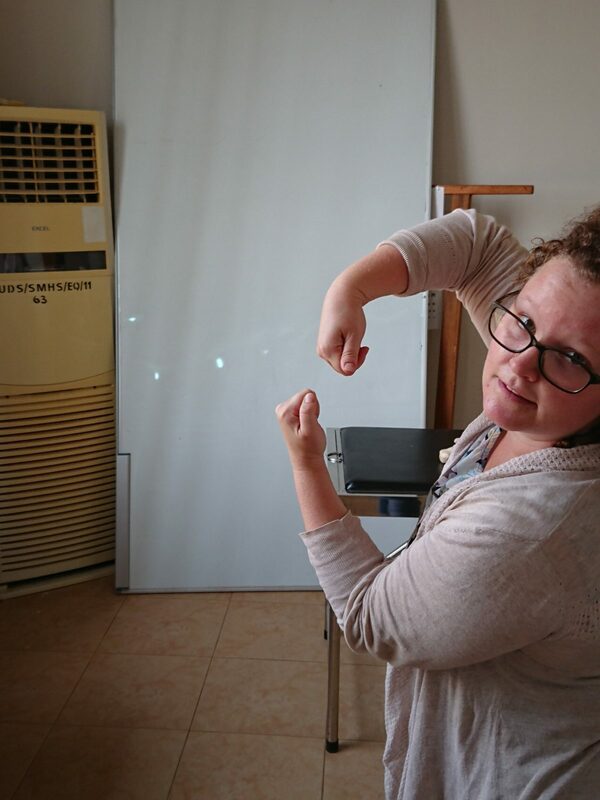 This post zooms in on the final element in the list, describing briefly and preliminarily the role of modelling in teaching students about bodily movement. Charles the plastic skeleton was a constant companion of the students in their skills lessons the last five weeks. Even when it seemed he managed to escape to the sidelines, he was pulled front and center to make a point for the class’ benefit. One instructor would temporarily neglect the living, breathing student volunteer who sat on an examination bed in front of the class and instead rely on Charles for demonstrating the limitations of human limbs. The instructor would, for instance, extend Charles’s leg at the hip in the direction of his spine to the point that the leg was perpendicular to his upright back, a move that would have been nothing short of grotesque in someone of flesh and blood. The purely skeletal nature of Charles’s dangling limbs, held together by wire pins, allowed for something the healthy student volunteer did not, a kind of hyperbolic modelling which ironically highlighted the normal degrees of human movement and invited an imagination of the muscles and ligaments needed to adequately limit Charles’s movement. At times, however, even the models were too limited in their movement, and instructors would default back to the body, but not necessarily to the part of the body under scrutiny. 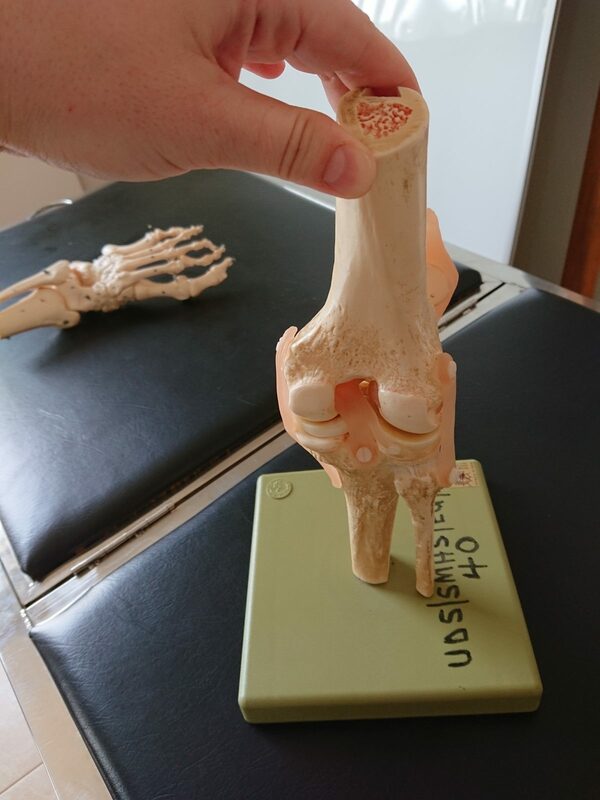 For example, before going through the protocol for examining the knee, an instructor used a model of the knee to zoom in on two ligaments nestled in the hollow between the femur and the tibia. These ligaments prevent the tibia from dislocating. 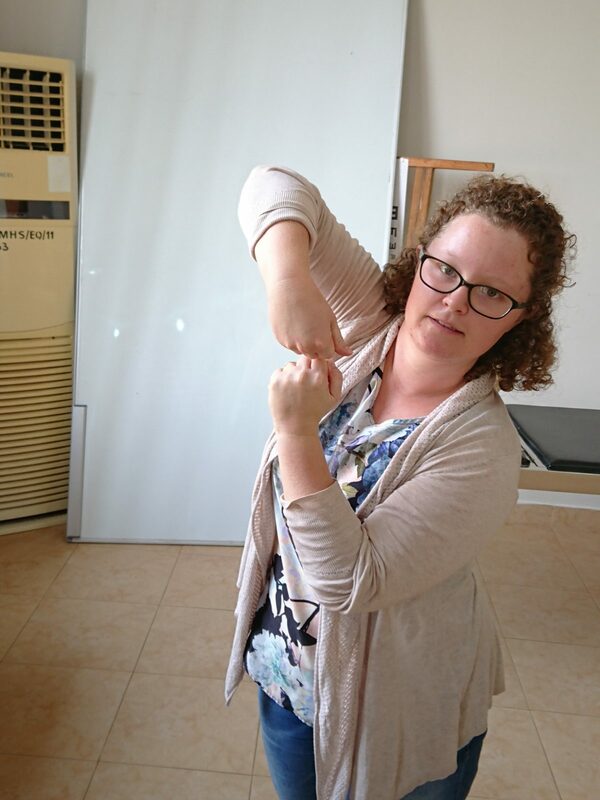 Then the instructor tried to demonstrate what would happen if the ligaments were torn, holding the floating femur with one hand and pulling at the tibia with the other (see my reenactment below). 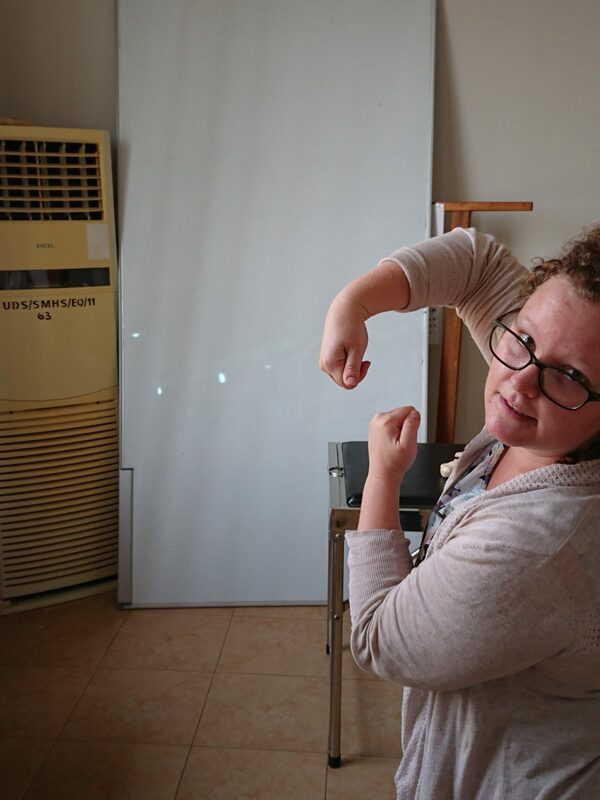 After a few attempts, the instructor put the model down, made fists, and placed them against each other with one forearm running towards the floor and the other towards the ceiling, creating a model of the knee using hands and forearms. This model was easily able to demonstrate the abnormal movement of a dislocated tibia resulting from torn ligaments in the knee. During the musculoskeletal physical examination block, instructors creatively utilized models and modelling to teach students about bodily movement. This often took the form of using a model to exaggerate an abnormal degree of human movement to ironically invoke the normal. At other times, the models were too securely and representatively constructed to deviate from normalcy for the purposes of education. When this was the case, instructors created models on the spot, using their own body as the resource.